Also on Saturday, Morning Star Gali (Pit River) spoke about Glen Cove to a very supportive crowd at the annual African Liberation Day event in Oakland. She sat on a panel alongside representatives from the Palestinian Youth Movement, the Nation of Islam, the Haiti Action Committee and the All African Peoples Revolutionary Party. On Sunday the 29th, numerous visitors arrived at Sogorea Te with donations of food, water, tents, and other needed supplies. 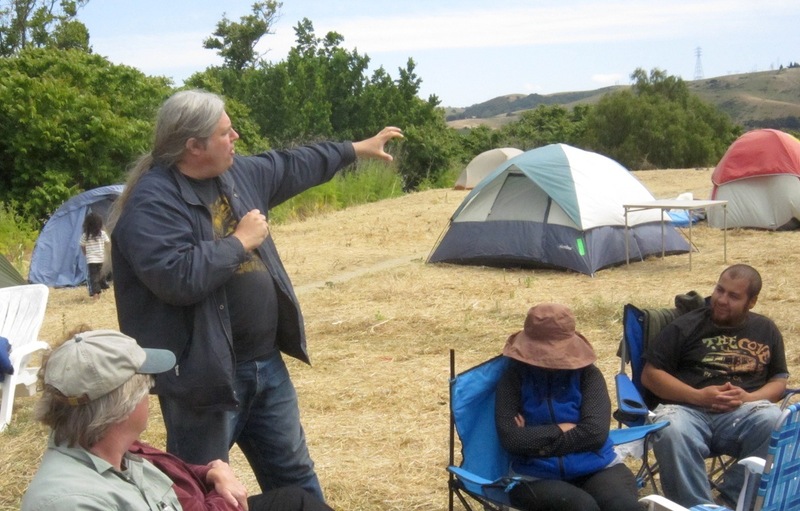 These kind visitors included Monte Pereira (Miwok), Vanessa Huang, Lily Haskell, and representatives from the All African Peoples Revolutionary Party, the Umpqua tribe and the Berkeley Fellowship of Unitarian Universalists. 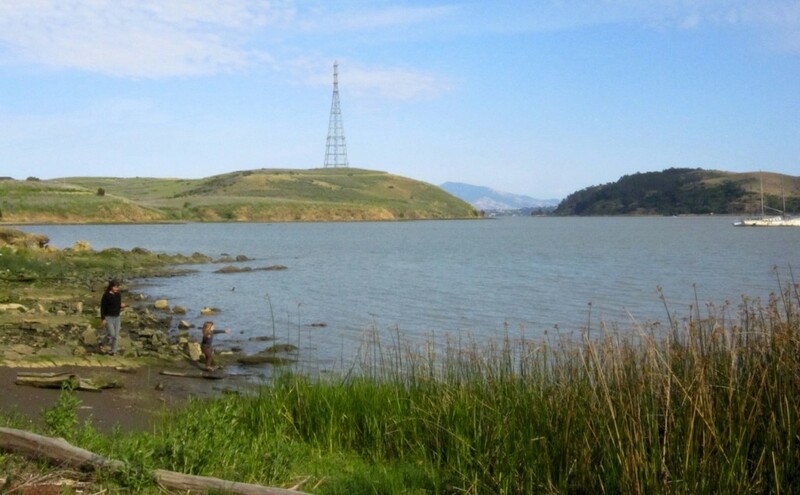 At dinnertime, George Cammarota’s Sicilian family brought delicious Italian food from their Italian restaurant in San Mateo. 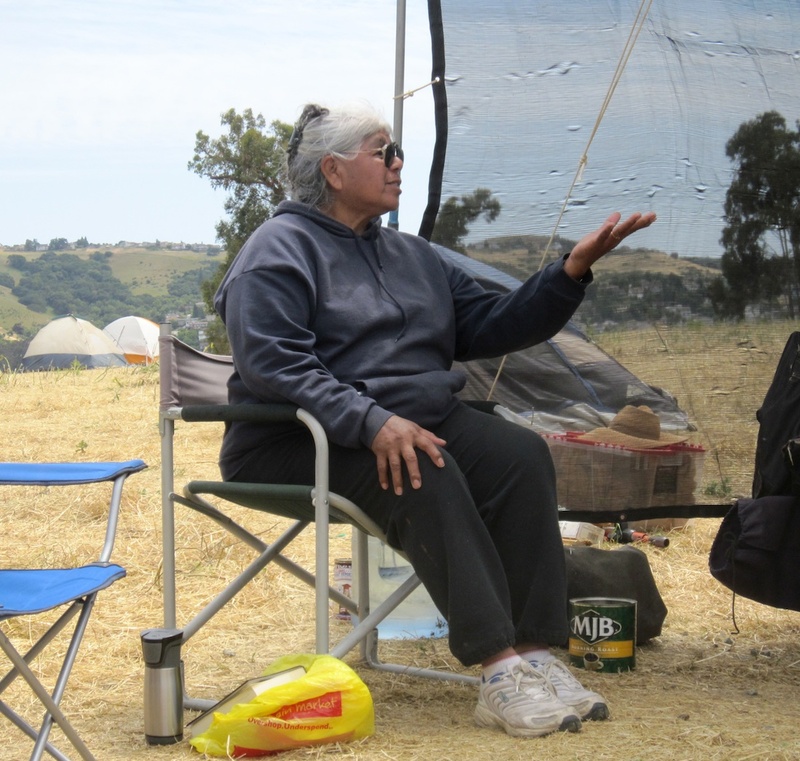 At morning circle on Monday, Merle Whistler (Lakota), who has been standing with us for a few days, led a prayer in Lakota language. This prayer was followed by California prayer songs sung with clappers, in part to honor and see off two long term participants in the spiritual encampment who are now headed to Big Mountain, Arizona. Above: Shirley Guevara (Mono) addresses group. Below: Michael Lane (Menominee) gesticulates. 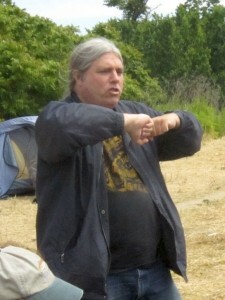 After Shirley Guevara finished her story, Michael Lane (Menominee Nation) spoke to the group about Aboriginal Title. Michael has been visiting for the past week and is a long time indigenous activist who traversed the entire country in 1978 as a participant in the original Longest Walk and holds a degree in Federal Indian Law. He contrasted the concept of inherent rights and responsibilities to that of delegated rights as defined by a European legal norm. 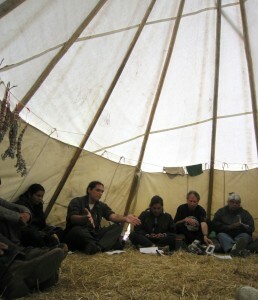 Lane emphasized the importance of understanding and asserting true Aboriginal Title and Indigenous Sovereignty, so as to not unintentionally contribute to further “conquest by law”. 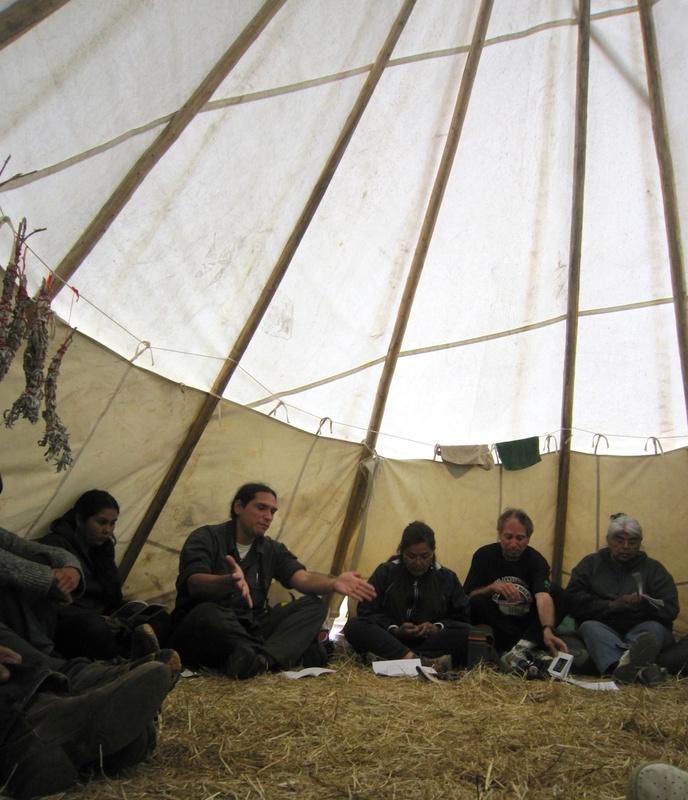 He explained that the indigenous concept of sovereignty as responsibility and respect is distinct from the European notion of sovereignty as a matter of power and control. 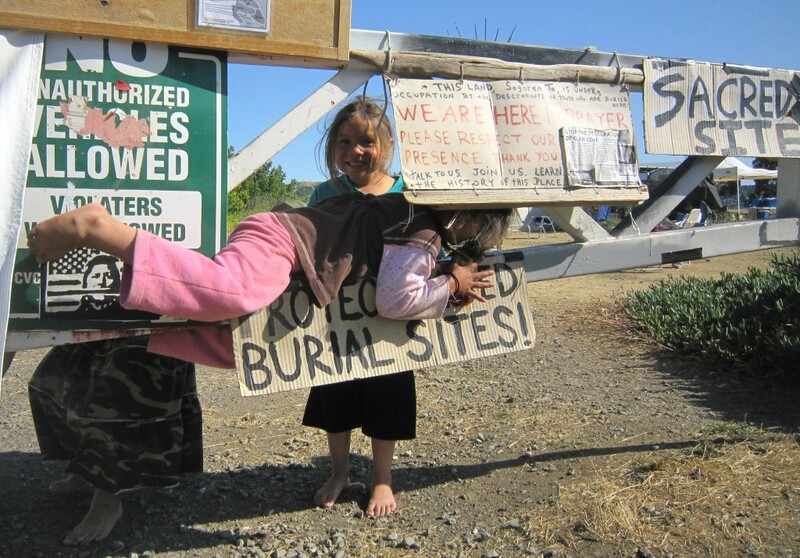 In the evening, John Malloy and Mia Tagano (organizers of the 500 Mile American Indian Spiritual Marathon) visited and brought supplies, including a new teepee canvas. 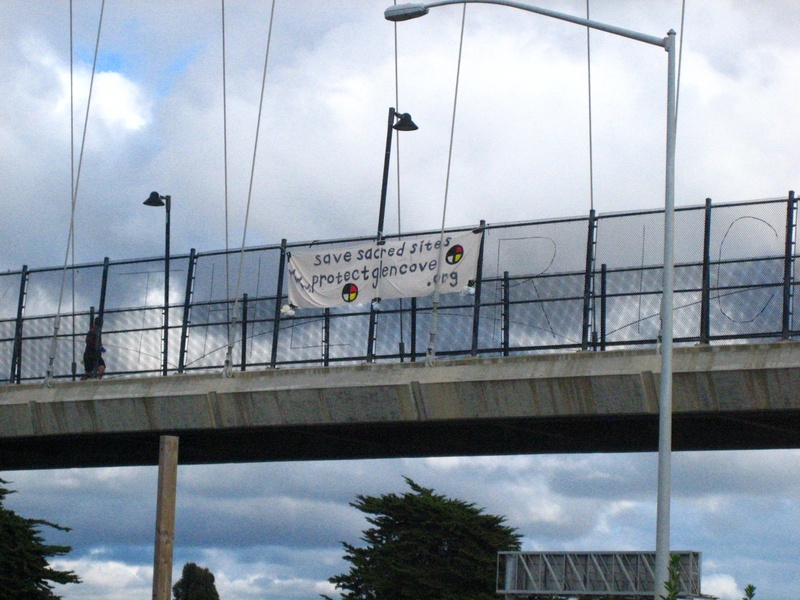 Around 6:00pm, the Glen Cove Solidarity Working Group hung a large banner on an overpass above Interstate 80 in Berkeley. 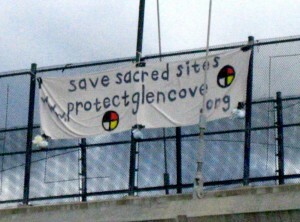 The banner reads “Save Sacred Sites, Protect Glen Cove [.org]” and has remained in place now for well over 24 hours, catching eyes during multiple rounds of rush hour traffic. 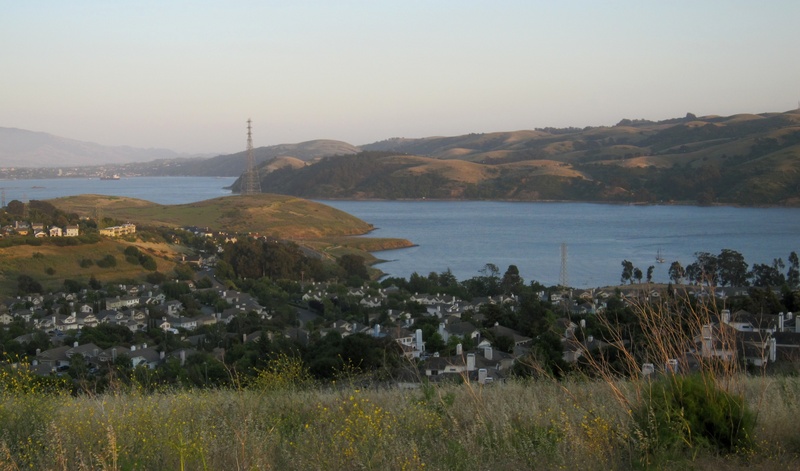 Looking down towards Glen Cove from atop a nearby hill. 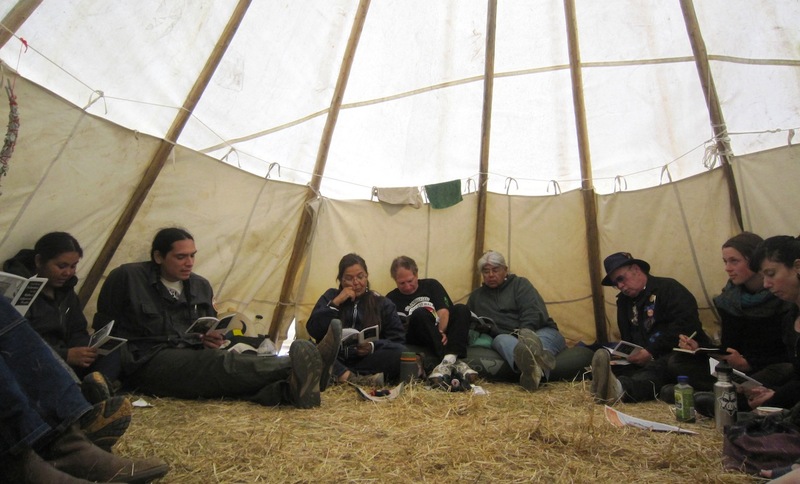 Reading and discussing the United Nations Declaration on the Rights of Indigenous Peoples. 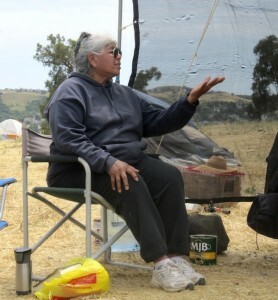 Listening to Shirley Guevara’s story of the Alcatraz Occupation. KEEP UP THE GOOD WORK BROTHERS AND SISTERS, JUSTICE WILL PREVAIL.